This month, Kitchen Chick has set us a challenge...to make a souffle! In the classic dishes yearbook, I think the souffle traditionally wins the title "Most likely to collapse and ruin your nice dinner party" so it is a dish many cooks fear to make. I for one can't even remember if I have ever eaten a souffle. But the idea of a delicate concoction of eggs and cheese, puffy and golden to be savoured right after it comes out of the oven...so tempting, right? First things first: sweet or savoury? I will take savoury every time. Next issue: choosing a recipe. I found a whole bunch of recipes on BBC food that I liked. But again, I don't own a souffle dish or ramekins. It was a choice between running to Bed, Bath and Beyond to buy a souffle dish, or making do with a shallow gratin dish. Then I came upon this recipe on BBC food that calls for baking the souffle in a hollow bread loaf! Perfect: an edible souffle dish. I modified the recipe to include mushrooms and spinach, because I love the combination of mushrooms, spinach and cheese; and also to get some vegetables in. 2. Hollow out the loaf of bread. Save the hollowed-out bits for another use. 3. Rinse the spinach and place this wet spinach in a microwave-safe bowl. Microwave on high for 2 minutes. Press out all the water and chop the spinach. 4. In a skillet, heat the butter and saute the spinach and mushrooms for 2 minutes. Season with salt and pepper. 5. In a bowl, break up the cheese into little bits. Add the mushroom-spinach mixture and the egg yolks and mix well. 6. Beat the egg whites to soft peak. 7. Gently fold whites into the cheese-egg yolk-vegetable mixture. 8. Pour the mixture into the hollowed loaf. 9. Bake in the oven for 20 minutes until the soufflé is cooked. The verdict: We loved it! I still have no idea if the souffle rose as much as it could have. It was puffy but not outrageously so :) The souffle never deflated which makes me think it did not rise too well to begin with. The baking toasted the bread, while the mixture inside was creamy, fluffy and delicious. The combination was so good together. I will make this dish again and again! Next time I might add some nutmeg for the extra flavor. Thanks Kitchen Chick, you really made me expand my culinary horizons! Wow...what a neat idea! I'd never have thought of using a bread bowl. (I had to go run out and buy a souffle dish for this event, myself.) As fussy as they are...I still think a souffle in a bread bowl would be a perfect party food! Looks delicious. What a great idea. That sounds sooo good and what a practical solution. Less dishes to wash and as stated, a great idea for a party. be warned, i'm going to stalk you down next week because recently i've been marvelling in Rasams. i'm curious if you ever make it and have a special recipe. If you are around Einstein today, you should come by for some cheesecake. see, i do try to be reciprocal in gustatory delights! Thanks for your novel souffle contribution; it vastly improves my opinion of bread bowl food. As a resident of the San Francisco Bay Area for many years, my opinion of bread bowl meals has been thoroughly degraded by the overload of soups in a San Francisco sourdough bread bowl at tourist spots around the city (which I must sometimes pass to get to my desired location, e.g., bicycling from the Ferry Building to Fort Mason). Of course, they aren't using outstanding bread like Balthazar's, nor are they filling the the loaf with such good ingredients. I love this, Nupur. I am definately going to try a bread bowl souffle in the future! What a gorgeous meal, Nupur. Looks great! Oh man, that looks DEEEEElicious, Nupur. I have a practical question - how do you serve it? Does it cut easily? Wow- your blog is wonderful and stuffed with so many great ideas! I'll be back many times. And thanks for dropping by my blog and leaving a comment about Mother Teresa! How innovative! And the cheese-mushroom-spinach combination....mmmm *smacking my lips*! Hi Alice, I was so delighted to see this bread bowl idea on the BBC site! You are right, this would be perfect for a small dinner party. I am sure one could hollow the breads a couple of hours in advance. Hi Laureen, you mushroom-hater, you! :) Stop by anytime for a rasam recipe...my favorite is ginger-lemon rasam...the recipe is in my head but I can write it down for you. Hi Marc, I had no idea bread bowls were so popular in SF...this is the first time I tried using it. I so agree that one should use the best possible bread for this recipe! Hi Shyam, I served it in wedges. The bread is crusty and toasty so there is a "crunch" as you cut it, but a sharp bread knife makes it very easy to cut neat wedges. Hi Faffer, yeah I am a BIG fan of this particular combo! Very innovative, Nupur. An edible soufflé dish! Love it. And I too like the combination of spinach, mushroom and cheese. Cool stuff! 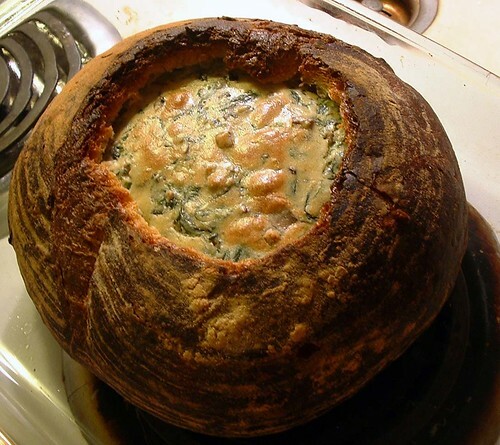 I really like the idea of a bread bowl souffle and the combination of spinach, mushrooms and cheese. Yummy. Believe it or not .. the first time I ever ate a souffle (and it was the best souffle I have ever eaten) was in Kolhapur!! It was a Mango Souffle at the Shalini Palace!!! Which also reminds me -- they had a Pandhra Rassa to die for. Nupur, how very creative! Your souffle is perfect for this time of year. It could certainly make a very nice evening supper. Very nice! I'm glad you didn't have the needed ramekins! Hi Brett, glad you like it! Anya, really? I like going to the Shalini Palace, my parents take me out for dinner there every time I visit them. Yeah, their food is pretty good! Nupur, Happy Diwali for next week. I better wish you before I forget. How wonderfully creative! Thanks for sharing it with us! Hi Boo, thanks for the wishes, and wishing you a very happy diwali too! :) So sweet of you to remember! Hi LisaSD, glad you like it! Now thats clever! And delicious looking too. Supriya, as far as I know, eggs are an essential part of a souffle...but you could make a plain white sauce , stir it up with sauteed mushrooms and spinach and serve it on bread, topped with some cheese for another delicious version, although that can't be called a souffle. I like your blog very much; although I don't usually contribute commentaries I will this time, as you wrote you wondered whether your soufflé had risen as much as it could have; actually it is essential for a soufflé to rise properly that it be baked in a soufflé dish; namely not too wide nor shallow; with a very straight rim, that should be buttered all the way to the very top. Also it should be placed at the very bottom of the oven. Therefore I believe you soufflé certainly didn't rise as much as it could have, it's nonetheless a very tempting recipe! Have been wanting to make this for a while now, and finally did ! It turned out GREAT. Thanks again for a g8 find.